THE EXPLORERS: The Reckless Rescue is on sale now!! Adrienne is writing the BENDY AND THE INK MACHINE novel! Adrienne is seriously excited to announce she is officially writing the young adult Bendy and the Ink Machine novel for Scholastic (USA/Canada)! 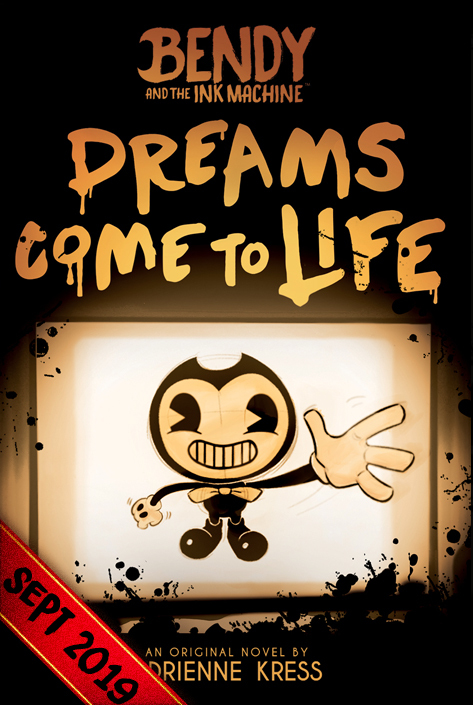 It’s called DREAMS COME TO LIFE and comes out September 3rd, 2019 (yes, THIS fall!). 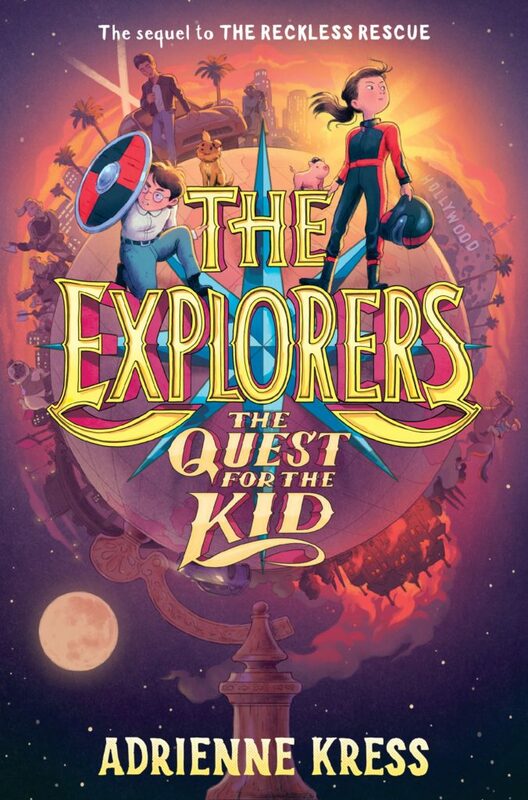 Book 3 of THE EXPLORERS series, THE QUEST FOR THE KID, has a cover and a release date! Coming August 2019!! “The third book in the Explorers series has more mystery, more bravery, more danger than ever before! And there’s still an explorer hanging from the edge of a perilous cliff! 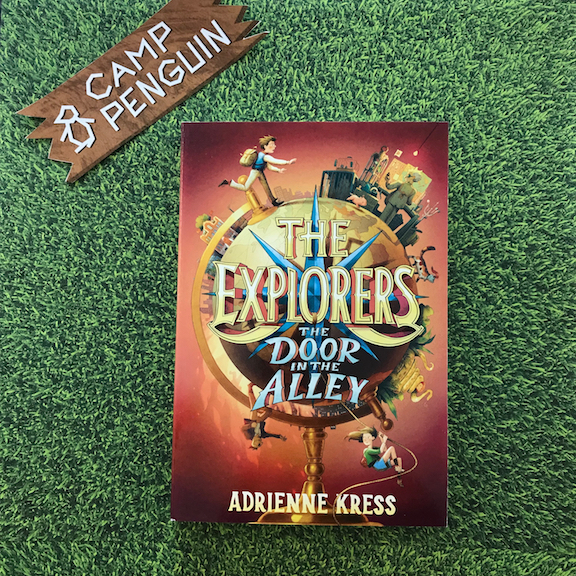 THE EXPLORERS: THE DOOR IN THE ALLEY is one of 15 books that’s been chosen to participate in this year’s #CampPenguin! Read here all about it and to find participating bookstores. And visit here to enter to win three of the books! THE DOOR IN THE ALLEY is nominated for the MYRA! 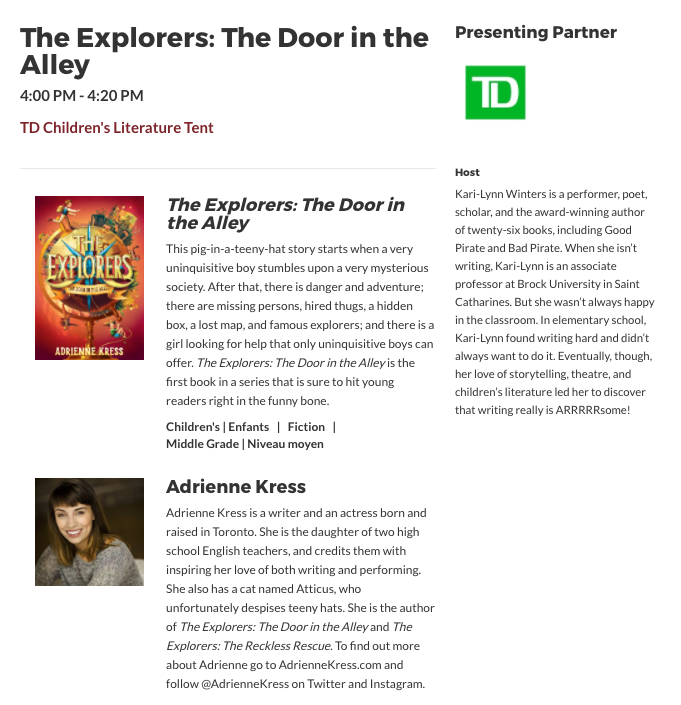 THE EXPLORERS: THE DOOR IN THE ALLEY has been nominated for the MYRCA (Manitoba Young Readers Choice Award). 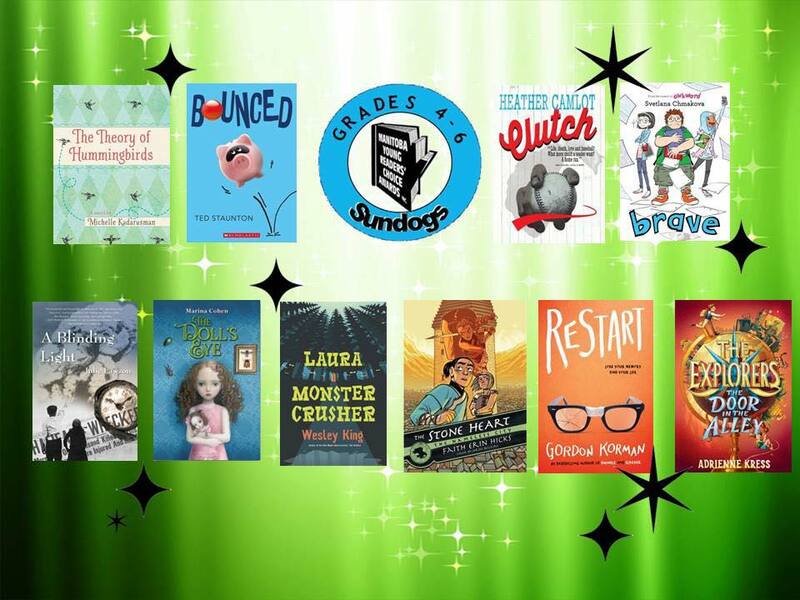 It’s truly thrilling and an honour to have the book be on such a list with such amazing other works! THE RECKLESS RESCUE launch party! 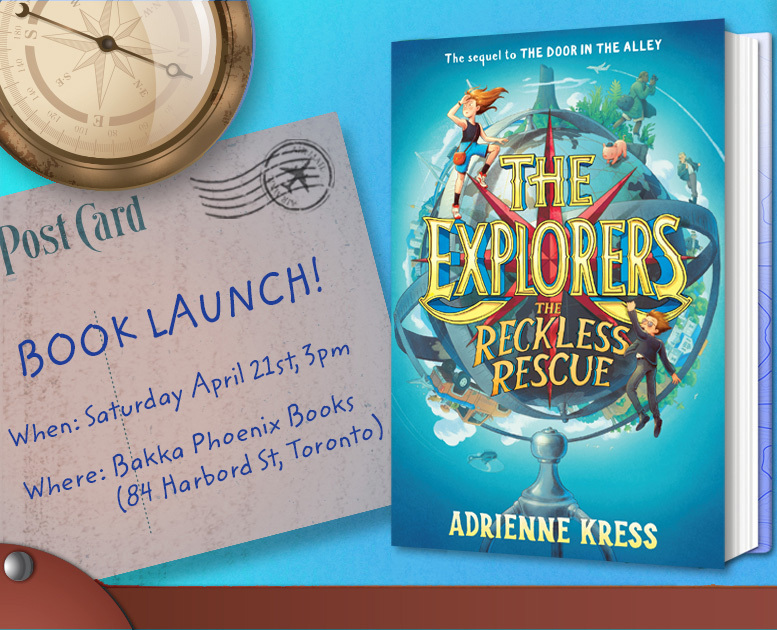 Book 2 in THE EXPLORERS series will be launching Saturday April 21st, 3pm, at Bakka Phoenix Books in Toronto! For more info please visit the Facebook event page here! 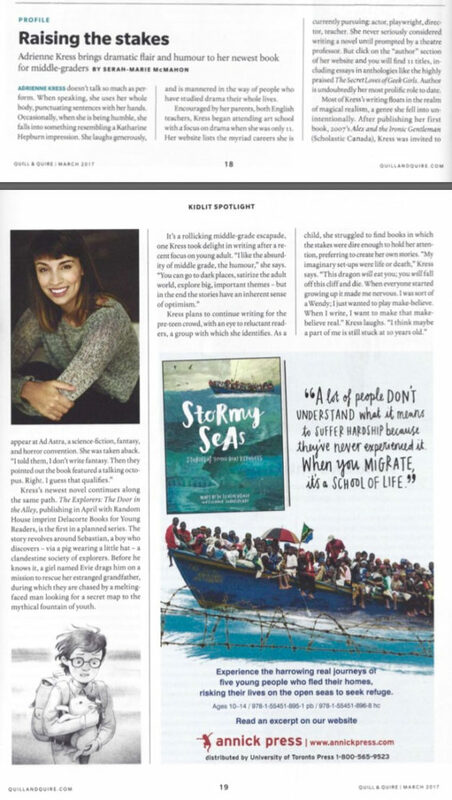 Lovely review from Kirkus for THE RECKLESS RESCUE! 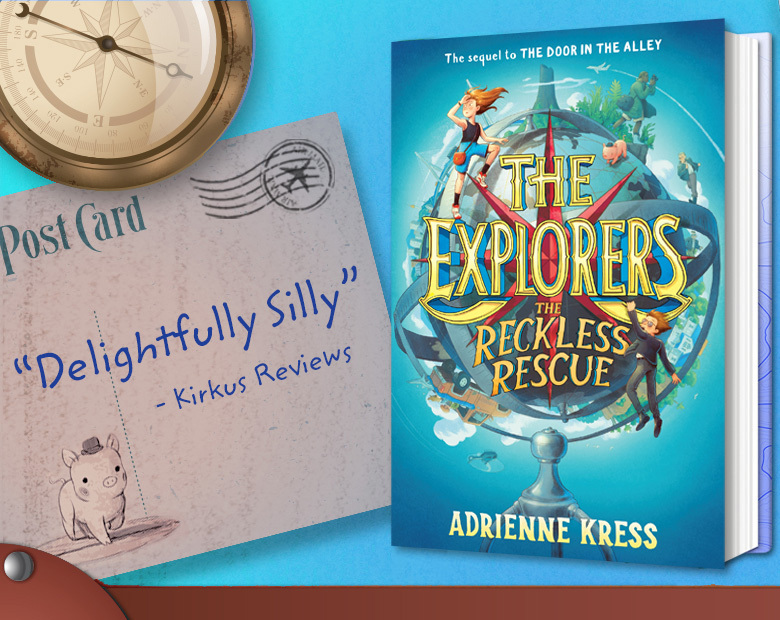 Kirkus continues to enjoy THE EXPLORERS series and gave THE RECKLESS RESCUE a most lovely review! They say the second book maintains “the same metafictive humor and goofy, sometimes-ranting, footnote-style asides as the previous book” and they also call it “Delightfully silly”! Which is pretty much the ultimate compliment! 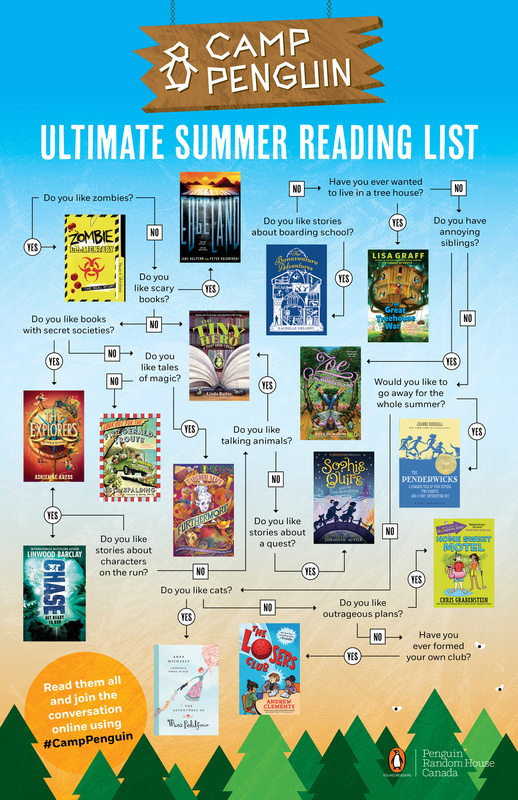 Get your free READERS ARE EXPLORERS poster! 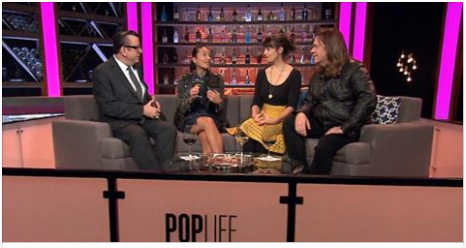 Adrienne was recently on PopLife on CTV! You can check out her chatting on the panel with Richard Crouse, Alan Doyle, and Lainey Lui here! 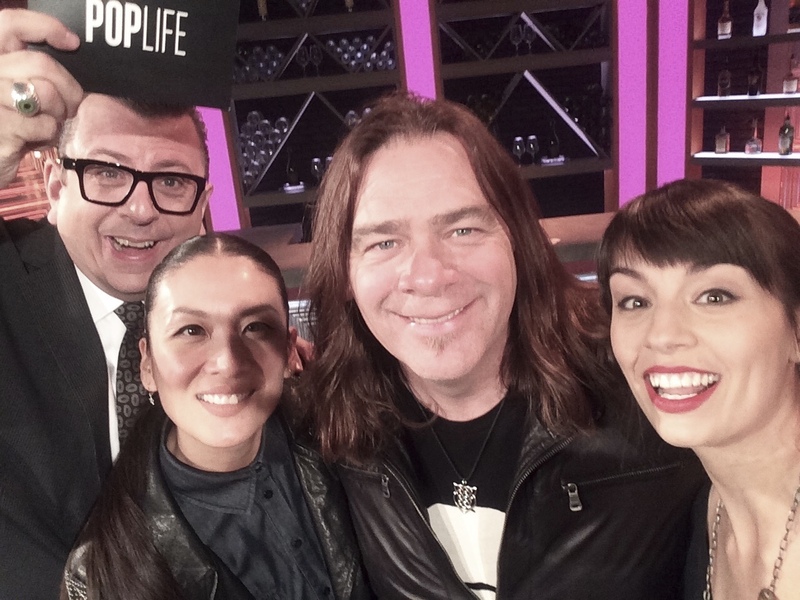 L to R: Richard Crouse, Lainey Lui, Alan Doyle and Adrienne. Adrienne will be at Word on the Street this September 24th! 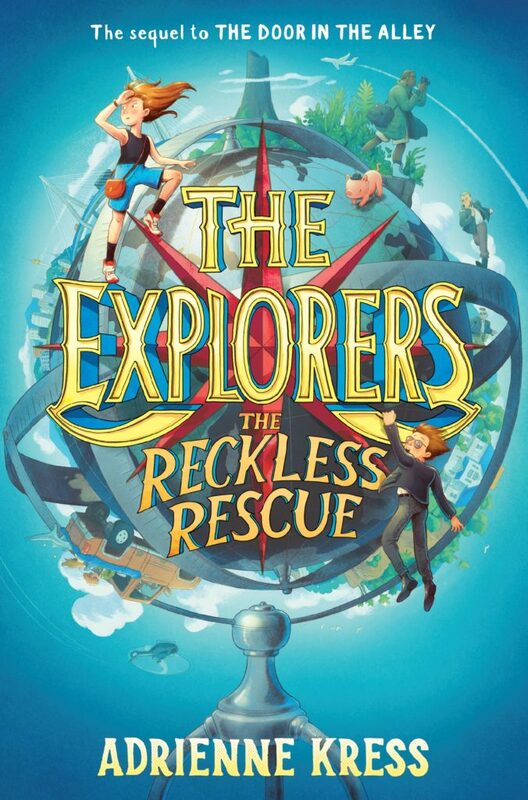 We have a cover for book 2 in THE EXPLORERS series people!! Check. It. Out. We have left things unresolved! What began as your average story of a boy stumbling upon a pig in a teeny hat and a secret international explorers society has turned into an adventure of epic proportions. The bad news: The boy (Sebastian) has been kidnapped by a trio of troublesome thugs. The good news: His new friend Evie has promised to rescue him! The bad news: Sebastian has been taken halfway around the world. The good news: Evie has famous explorer and former Filipendulous Five member Catherine Lind at her side! The bad news: There’s still the whole matter of Evie’s grandfather (the leader of the Filipendulous Five) somewhere out there in grave danger. 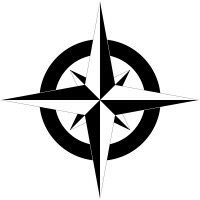 The good news: Pursuing Sebastian will lead Evie and Catherine to another member of the Filipendulous Five, who might be able to help. This missive is a call to action and an invitation to join in mystery, bravery, and danger. We are about to embark on one amazingly reckless rescue. ADRIENNE is back and it’s time to have a party! 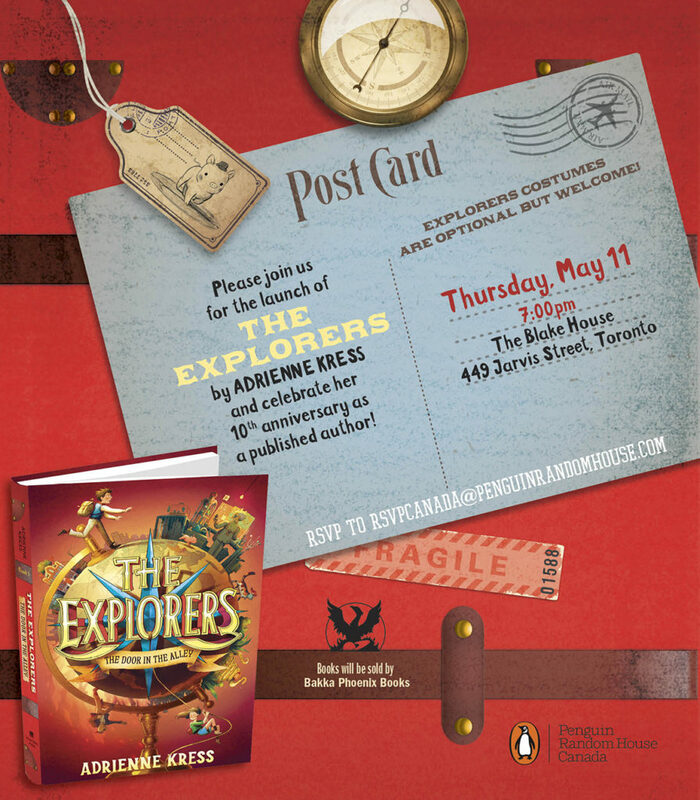 Come one come all to THE EXPLORERS book launch!! ADRIENNE starts her two week tour Tuesday April 25th! Come find her and say hey! NEWS – THE EXPLORERS exists!! Look! A real life book! 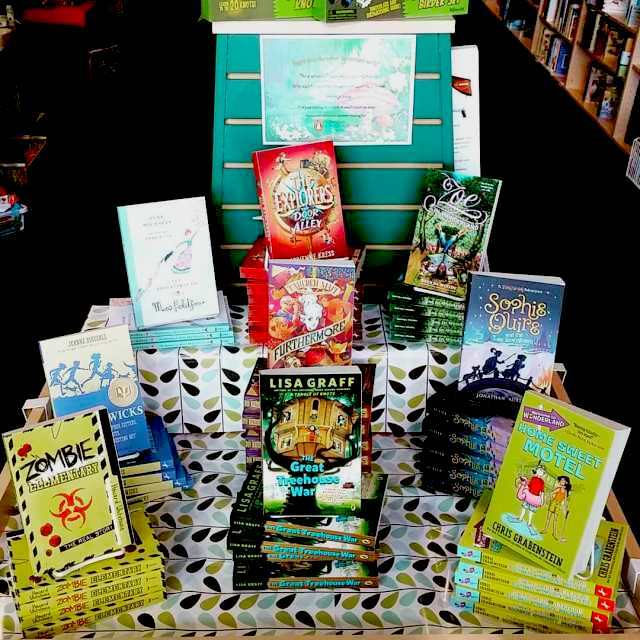 The book launches Tuesday, but it has already been spotted in the wild! Check out the finished product in all its exploring glory! 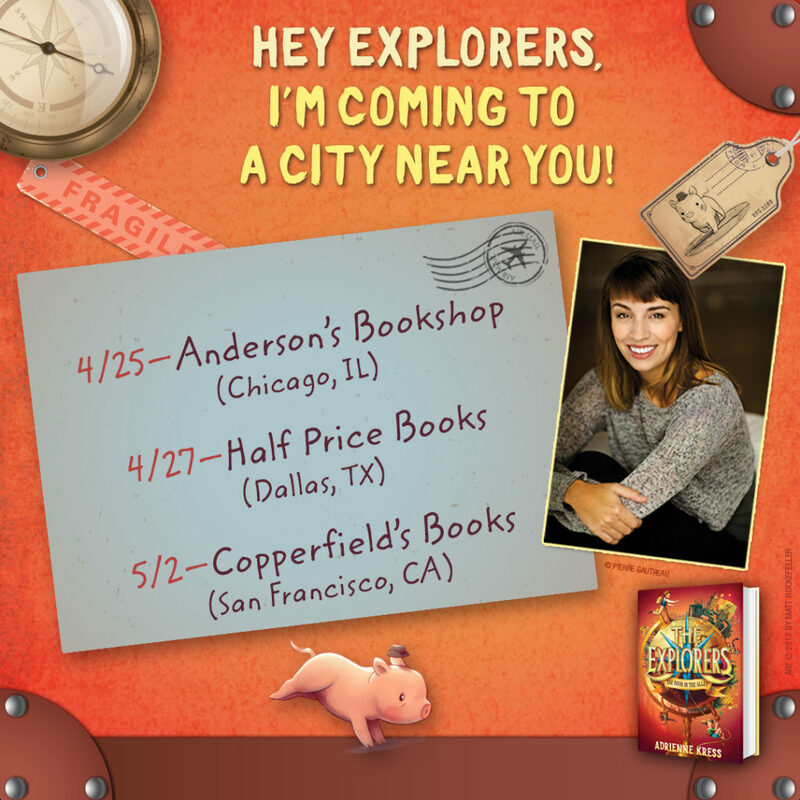 NEWS – THE EXPLORERS audio book preview! 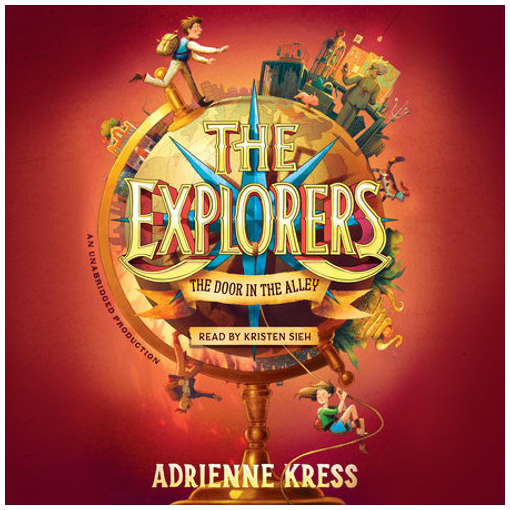 You can now sample the first five minutes of THE EXPLORERS audio book (out also on April 25th and narrated by the sensational and charming Kristen Sieh) for free here! 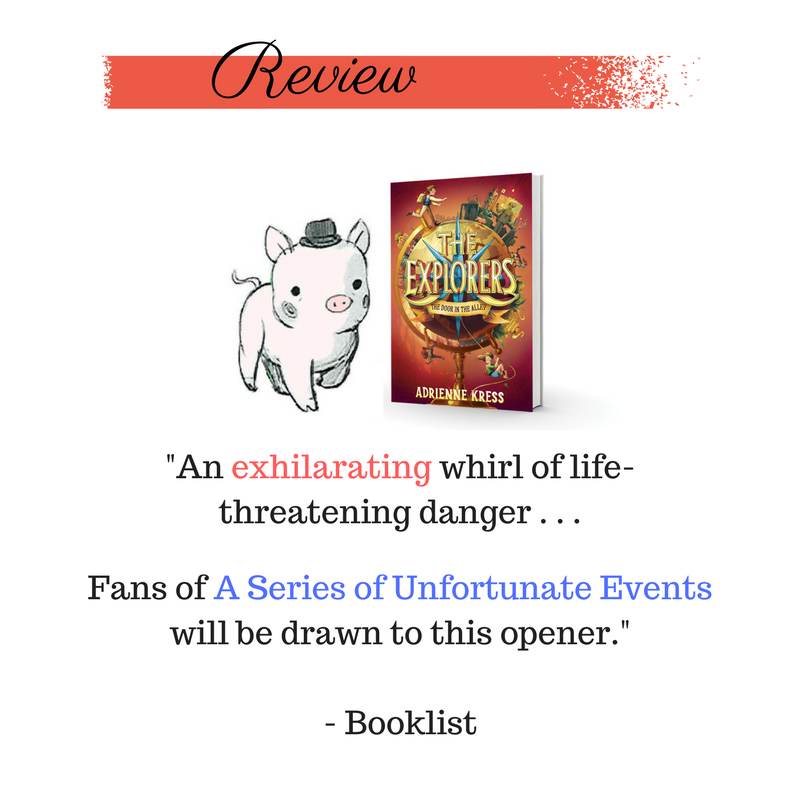 NEWS – THE EXPLORERS Booklist Review! Wonderful review for THE EXPLORERS from Booklist here! Check out Adrienne’s interview with the Quill & Quire where she discusses her influences and what it was like growing up as a reluctant reader. And also obviously about THE EXPLORERS! Read the full thing online here! 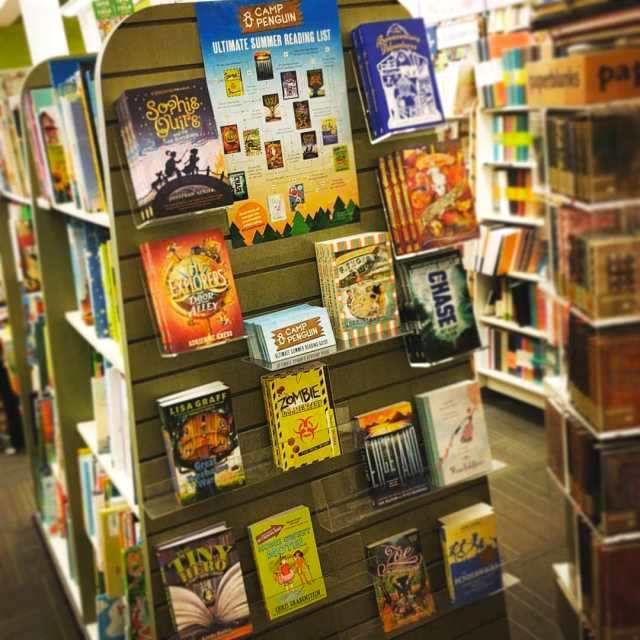 NEWS – THE EXPLORERS School Library Journal Review! NEWS – THE EXPLORERS audio book has a narrator! 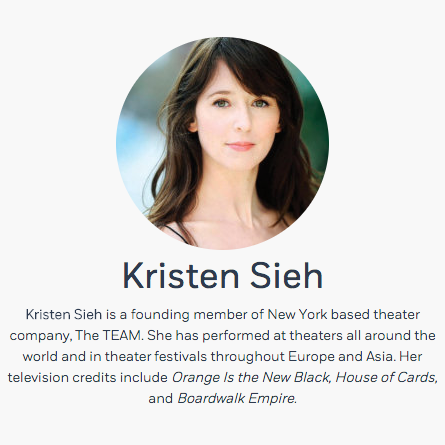 Adrienne is happy to announce that Kristen Sieh will be reading the audiobook of THE EXPLORERS! Her bio is in the pic below, and some of the other audio books she’s read can be found here. We are super excited to hear the finished result! NEWS – THE EXPLORERS first review! 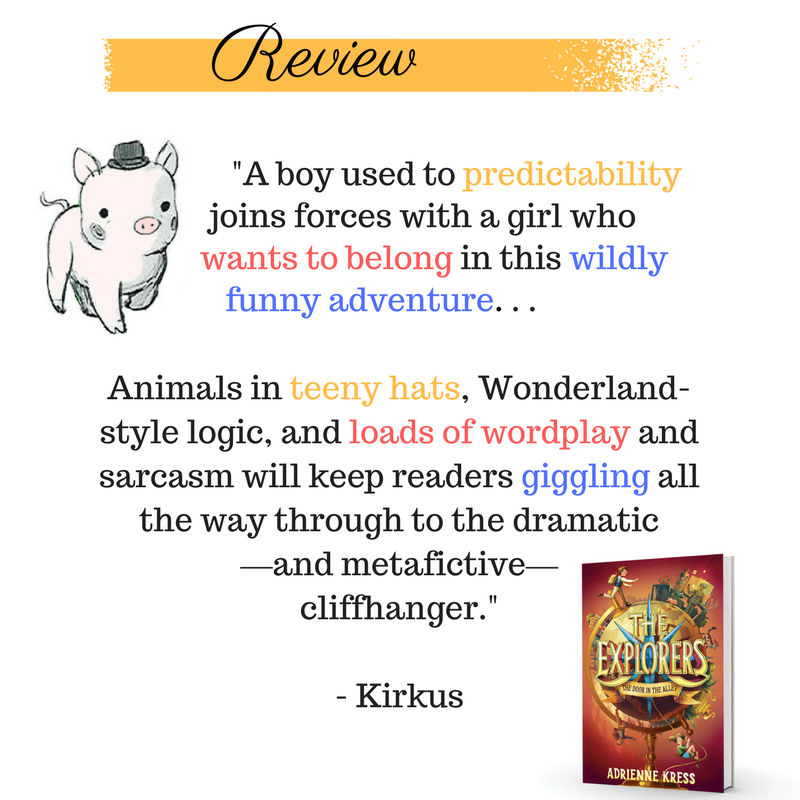 The first review is in for THE EXPLORERS and it’s a great one from Kirkus! Enjoy an excerpt below and read it in full here! NEWS – THE EXPLORERS cover!!!! 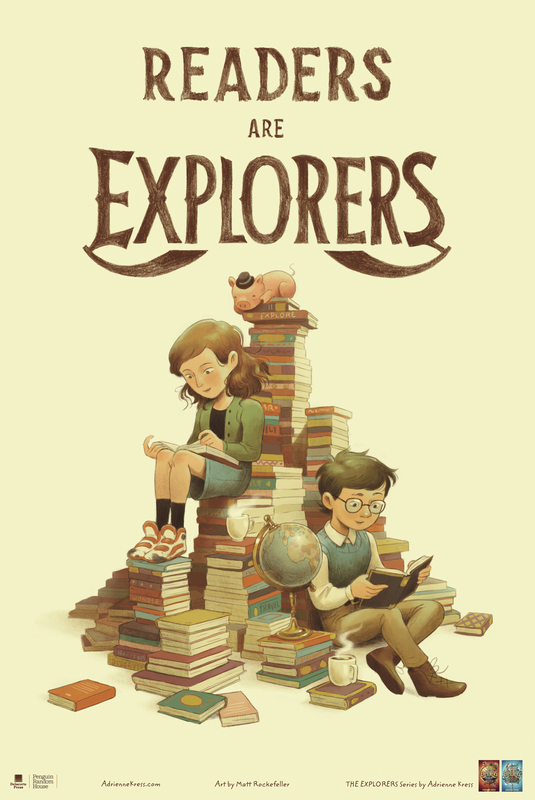 Check out the AMAZING cover for THE EXPLORERS!! Art by the amazing Matt Rockefeller. 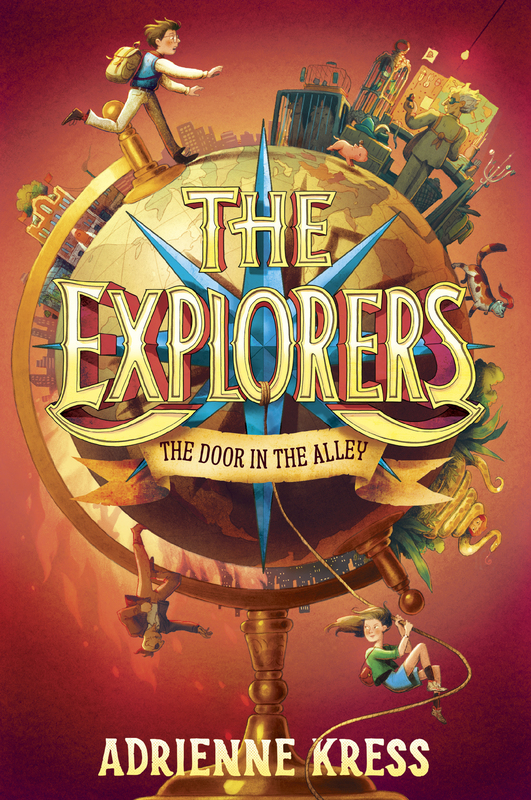 NEWS – THE EXPLORERS CLUB has a new title! Tis true! And the title is . . . wait for it wait for it . . . (are you waiting for it?) . . .
To say that Adrienne is thrilled by the new title would be an understatement. It is title-tastic!! ♠ NEWS – HATTER MADIGAN: GHOST IN THE H.A.T.B.O.X is out!! NEWS – THE EXPLORERS CLUB coming spring 2017! 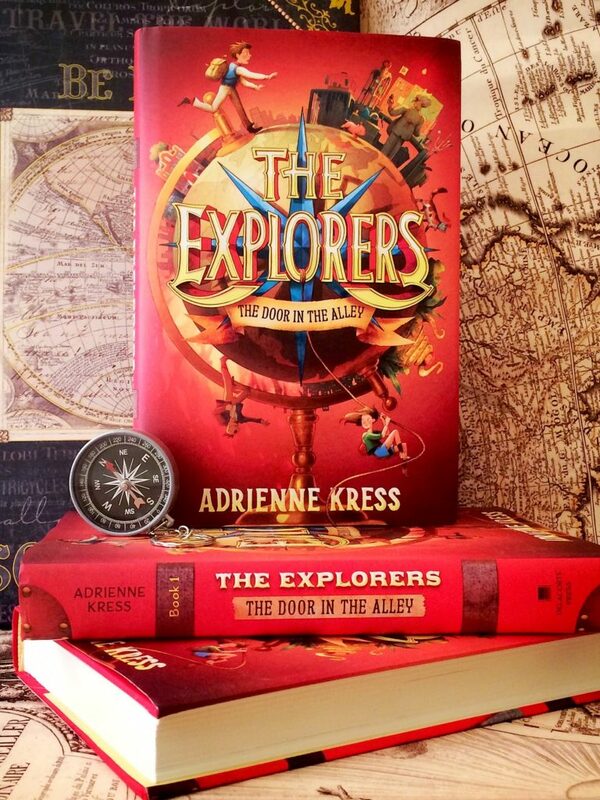 Adrienne has a new three book Middle Grade book deal with Delacorte Random House for her book THE EXPLORERS CLUB! 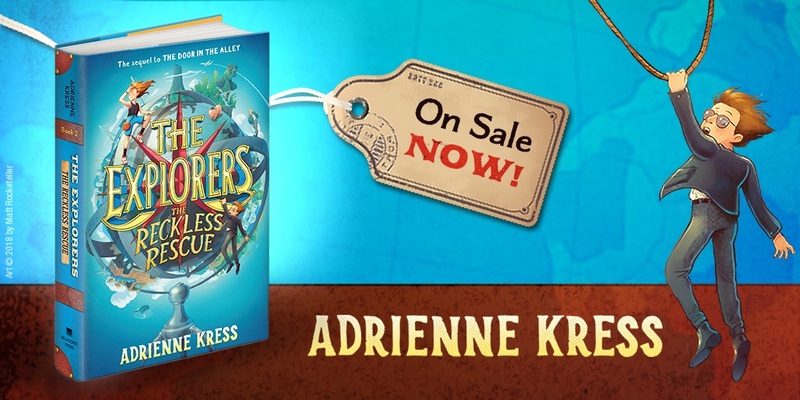 Krista Marino at Delacorte has bought Adrienne Kress’s The Explorers Club, first in a middle-grade series. The story follows a precocious boy whose life is sent spiraling into adventure after he discovers a pig in a teeny hat and returns it to its home at the mysterious Explorers Club. Publication is scheduled for spring 2017; Jessica Regel at Foundry Literary + Media negotiated the three-book deal for North American rights. 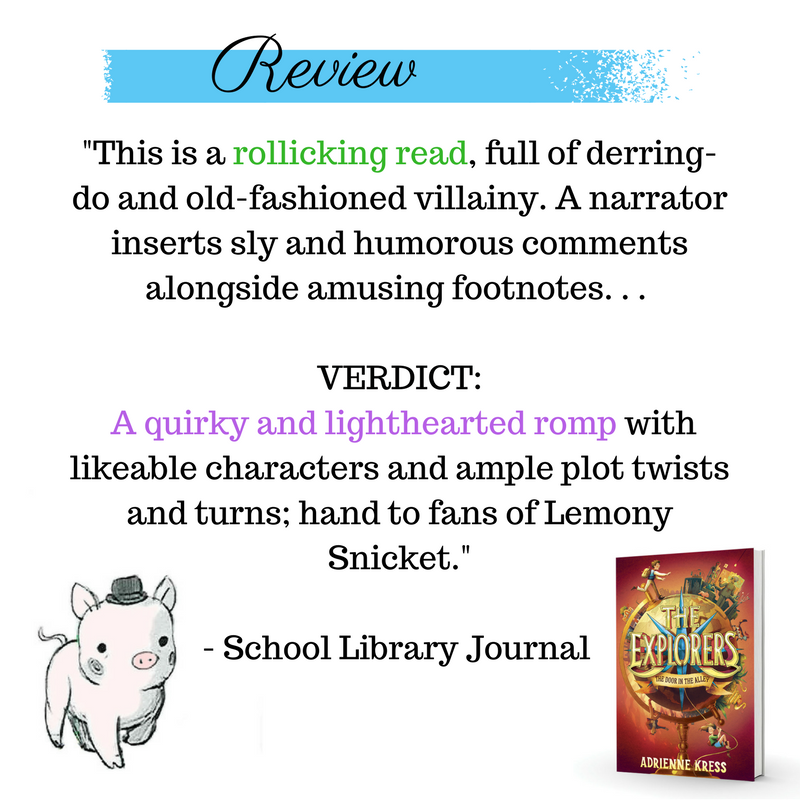 A little bit about the series: Yes the catalyst for adventure is a pig in a teeny hat but there’s even more to the book (can there be more after a pig in a teeny hat?? Need there be more??)! Set in a similar kind of world to Alex and the Ironic Gentleman and Timothy and the Dragon’s Gate, two kids, Sebastian and Evie, set out to reunite the formerly famous explorer team the Filipendulous Five, who disbanded many years ago and no one knows why, in order to rescue their leader (who also happens to be Evie’s grandfather and only remaining living relative). There’s a lot more to it but, you know, that’s why you need to read the book! ♠ NEWS – HATTER MADIGAN: GHOST IN THE H.A.T.B.O.X. For the last several months Adrienne has been working/writing very closely with the incredible NY Times bestselling author Frank Beddor (The Looking Glass Wars, Hatter M Graphic Novel Series) on a prequel series set in his magical version of Wonderland called HATTER MADIGAN: GHOST IN THE H.A.T.B.O.X. It’s the story of 13 yearold Hatter Madigan who is training at the Millinery Academy with similar cadets to become one of Wonderland’s protectors: either a bodyguard, spy, strategist etc. The book will be out March 2016, and already has some great buzz surrounding it! 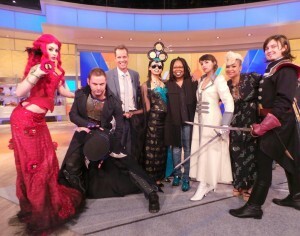 The cover was even revealed on The View! 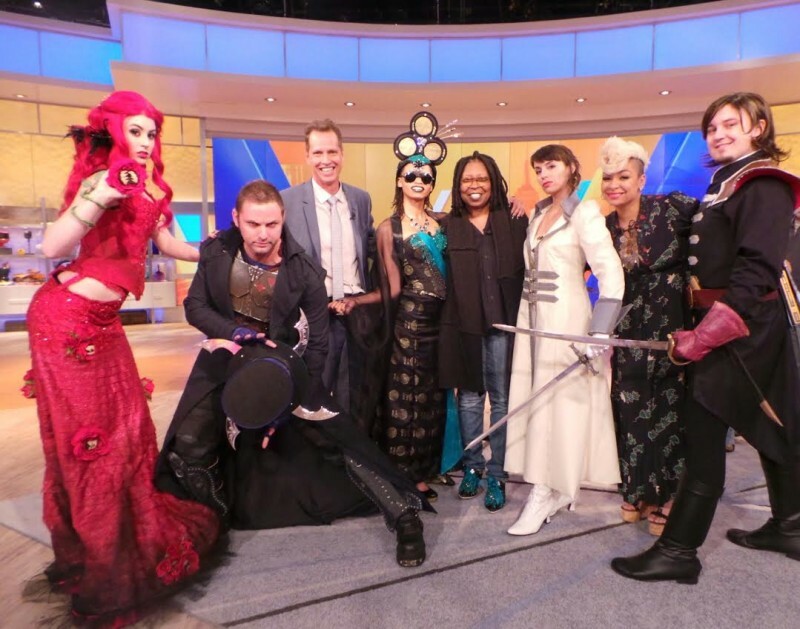 Adrienne (in white) and Frank on The View with Whoopi Goldberg and Raven Symone! (along with some incredible cosplayers) Click image for larger version.